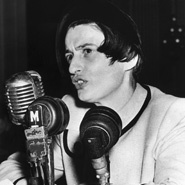 Novelist, playwright, and philosopher Ayn Rand was born in Russia and moved to Hollywood in 1926 to become a screenwriter, a year after arriving on a tourist visa. The Fountainhead (1943), her first literary success, tells the story of an idealistic young architect struggling with the theories of modern architecture. Rand's most famous novel, the intellectual mystery Atlas Shrugged (1957), marked the end of her career as a novelist and the beginning of her career as a popular philosopher. Her philosophy of Objectivism rejected faith in favor of rational self-interest, happiness, and productivity.